Rickson (pronounced ‘Hickson’) Gracie is undoubtedly one of the greatest fighters in the world today. In a martial arts world full of self proclaimed ‘masters’, he stands out as the real thing. I first met Rickson seven years ago and was impressed by his talent, honesty and integrity. 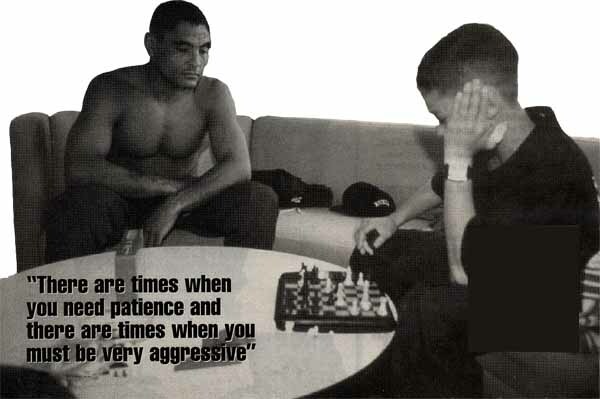 In this exclusive interview for COMBAT, Rickson talks frankly and openly about himself and his beliefs in his art. COMBAT: When did you begin training in Jiu-Jitsu? RICKSON GRACIE: In my family, training begins at a very early age and even before I was conscious of what I was doing on the mat, I was already creating moves and having fun discovering the different ways one can position the body. At age seven I began competing in children’s Jiu-Jitsu competitions and at around fourteen, I began to concentrate more on the technical aspects of the art. COMBAT: Who were your instructors? fight differently. We all use the same basics but we use them in different ways. COMBAT: What is the history of Gracie Jiu-Jitsu? grow in a very realistic way. COMBAT: So Gracie Jiu-Jitsu is a developing art? RICKSON GRACIE: Yes, though it has a foundation and new developments cannot go against this. You must understand how to use leverage and how to go against the opponent’s weakness. Sometimes with the older way of doing Jiu-Jitsu, your opponent might have had the opportunity to perform certain movements but nowadays he may know your defense, so you must always stay one step ahead and use something a little different. That’s normal evolution, and it never stops. I see this a great deal in Jiu-Jitsu. I find my opponents becoming stronger, getting better, and knowing what’s coming. However, on the other hand, I will discover different ways of approaching the situation and how to handle it. So Jiu-Jitsu is an evolving process, while still holding onto its roots. COMBAT: Is Jiu-Jitsu strictly a grappling art or does it contain striking techniques too? first. So learning how to strike is good but believing that it will save you every time, is wrong. COMBAT: How does Gracie Jiu-Jitsu differ from other grappling systems such as judo or wrestling? RICKSON GRACIE: Gracie Jiu-Jitsu is a combination of many things whereas judo and wrestling are 100% sports systems, specifically designed for competition. The fighters can be very tough and it is very difficult to beat any of them in a judo or wrestling tournament. Sometimes they need the grip of the gi to be effective in a judo tournament but this isn’t always available in a real fight. In the same way some people need to be able to punch and kick and these too are not within the rules of judo and wrestling. So you see, you can’t become a good fighter if you always fight within set rules. You may have the advantage over the average person but you may not always have the edge to win. COMBAT What of your personal training? RICKSON GRACIE: I really believe that you are what you eat, what you think and what you do. That is my philosophy of life. You must exercise regularly and think positive in order to heal your injuries, to cope with training and to be happy. Your mental attitude is very important. If you have a goal in your mind, then even if you are putting everything you have toward it, you won’t be successful if you are suffering all the time. You must be happy in what you do, have the nutrition and the attitude as well as doing the training. My personal workout involves a combination of breathing, flexibility, strength, coordination, balance, and speed, and this takes about two hours of my time each morning. I also swim, ride my bike and teach for two or three hours. If I am preparing for a competition then I teach less and work out about six hours a day – three hours of technique and training and three hours of exercise. The remainder of my time is spent resting and rebuilding energy. COMBAT: Who do you work against In order to stay sharp? RICKSON GRACIE: For a long time now I have not had anyone who can keep up with me in my training, so I’ve discovered ways to work around this. For example if I am going to fight with an average student and I try to win using any and all techniques, then it will be rather easy for me. But if with the same student, I restrict myself as to the technique or techniques I can use, then I can work on timing and precision even when sparring with an average performer. COMBAT Have you studied any other martial art systems? RICKSON GRACIE: No, but I’m curious to see what’s going around. I have done a little judo training with the Brazilian team, I entered wrestling competitions in Brazil and I’ve taken part in sambo competitions in the US. I know some guys who have a good knowledge of boxing and kickboxing and we play around with that too. I definitely believe that you must keep an open mind, never believing that what you are doing is the best, so you need nothing from anyone else. Sometimes if I see a movement I like, I’ll try to apply it in my own training. COMBAT: Why do you think you are a champion? RICKSON GRACIE: First of all I have dedicated my life to Jiu-Jitsu. I am a perfectionist, I have good techniques, I take care of myself, and I can see things in my mind. This helps me to see and understand what’s coming at me. There are times when you need patience and there are other times when you must be very aggressive. You must know exactly what you are doing, even when under pressure and perhaps injured. Even then you must stay totally calm and focused. There are some things you just can’t learn, though, and you either have it or you don’t. COMBAT: What do you see as the ultimate goal in martial practice? with other people. For those who live in the city and who deal with daily problems and stressful situations, martial art is a great help. It offers self control, inner peace, balance, the release of tensions and stress, and strengthens the personalities of young students. I think martial art is a positive experience, all around. martial art a bad reputation. I wish these people would just continue learning and developing their skills and thereby become more balanced. COMBAT: What are your plans for the future? RICKSON GRACIE: 1996 has been a very ‘technical’ year for me! In the first six months I concentrated on seminars, which were held in various cities throughout the USA and around the world. In January I created the Rickson Gracie American Jiu-Jitsu Association and since then, I’ve been busy connecting with associations in other countries. Although teaching requires a great deal of energy, I feel it’s a good investment in the growth of Jiu-Jitsu. I try to communicate the physical and emotional aspects of Jiu-Jitsu through my teaching, though many people either do not understand or want to see proof that what I say is true. I am more than happy to demonstrate the effectiveness of my beliefs through fighting. However, I don’t intend to challenge anybody special and I don’t have anyone special to fight. I believe everybody should learn and understand Jiu-Jitsu because it is a treasure which should be shared with all humanity. If everyone knows how to fight, then everyone is going to respect each other. I truly believe that my mission in life is to expand the skills of martial artists and thereby to expand the confidence of each person using martial art in a positive and meaningful way. COMBAT: RIckson thank you for the interview!